Shirts With Random Triangles: New t-shirt for Michigan fans who want a Harbaugh to be the next Wolverines head coach. New t-shirt for Michigan fans who want a Harbaugh to be the next Wolverines head coach. From the "Well, this didn't take long" dept. comes a t-shirt for those Michigan fans who have already decided in their own minds who the eventual successor to the embattled Wolverines head coach Brady Hoke should be. Alternative Hero, an online clothier that specializes in “weekly limited edition t-shirts on the internet,” has released a t-shirt for Michigan fans who wish to either San Francisco 49ers head coach Jim Harbaugh, or his brother, Baltimore Ravens head coach John Harbaugh, lead the Wolverines back into something resembling national prominence. 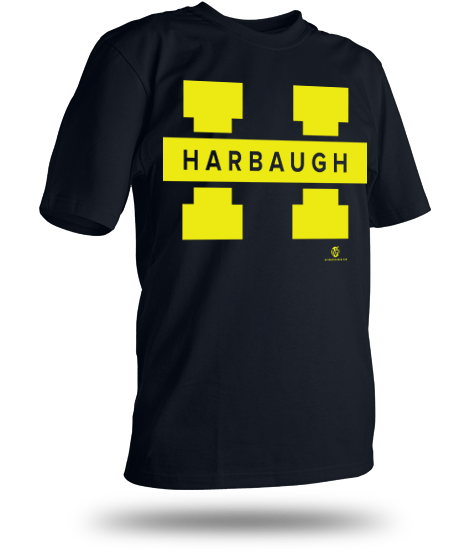 The shirt turns the Michigan "Block M" and transforms it into a Harbaugh "Block H." The shirts are on sale week for $18.00. They'll be gone after that, as Alternative Hero only sells its designs on a one-week, limited edition basis. Presumably because it takes a week for a cease-and-desist court order to be delivered.